Over the past few weekends I have been sifting through photos as far back as my great grandparents and as recent as 2006. I am starting with the older pictures, scanning and putting them into archival sleeves so that they do not deteriorate. Once they are scanned, I mess around with them for a bit in Lightroom until they look decent and then post them for the rest of the family. Phew. It has been really interesting seeing what my grandparents looked like when they were young, seeing what my great grandparents looked like. I am a little sad because a few of the really important people who would be able to fill me in on the story behind the photos have passed away. Their passing is what started me wanting to scan and share these photos. I also created a family blog with the intention of giving people a place to tell their stories. The neatest thing that has come out of this project is that my grandfather has started a blog of his own! (Hey Grandpa!) I love to read his stories. This photo above is of me and my favorite younger (not to be confused with my favorite youngest) sister. 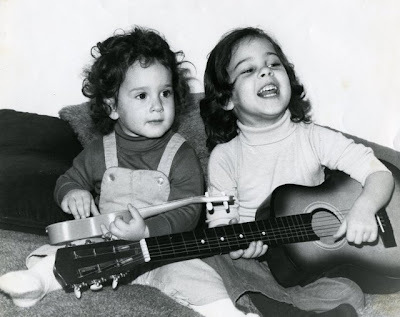 We were apparently guitar heros from way back.